You see, like everything these days, it's all sourced from China. It's because in our rush for lower prices, we lost sight of what is important. In "English Common Law" which is what our business law is loosely based upon in the US, there is the "Fitness of Purpose and Merchantability" rule. It is a pretty simple concept, it means that if you are selling something, you are telling people what it is for and that you are going to "warrant" that item to be appropriate for that use. That means that if you sell a rubber duck with a thermometer on it, your purchaser will expect that it will be accurate. Not always a big deal, right? After all if the pool is 80F it's comfy, and it won't ever get much above 87 or 88 in the summer, so what does it matter if it is a degree "off"? 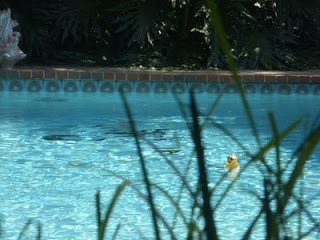 So you toss that duck into the pool, smile at it being cute, wait a bit and see that it's 70F on a warm day. Thinking that that water is too cold, and I am in Florida after all, I pull the duck out of the pool and we turn on the spa. If you have ever used a spa or a hot tub, you know that you shouldn't go above a certain temperature. Exposure to prolonged heat is a no-no and typically that temperature is 104. We tend to run the thing at 100F because it can be a beautiful thing. After fighting with the temperature all day, we manage to get that tub to a warm 98 degrees then step in. There's a problem here, it is way too hot. You see the Chinese Prisoner who made that duck didn't take the care that would have happened had I been able to get that same duck made by someone in a country with a better tradition of quality. Accuracy and quality is something that should be prized over cheapness in price, and we seem to have forgotten that sort of thing. The red white and blue "Made in USA" stickers that used to be all over the cheap items in WalMart, Target, and other discount stores have long since vanished. Not that Made in USA is a universal symbol for quality, as anyone who has ever owned a Chevrolet Vega would know, but for the most part it may be clunky but it worked. I got out of that hot tub quicker than normal and grabbed the other thermometer which I know was accurate and dropped it into the water. After cooling down in the 70 by the duck, 79 by the thermometer temperature water, we left that hot tub behind. The duck has since been taken away, not by us, but by a rogue backyard critter. 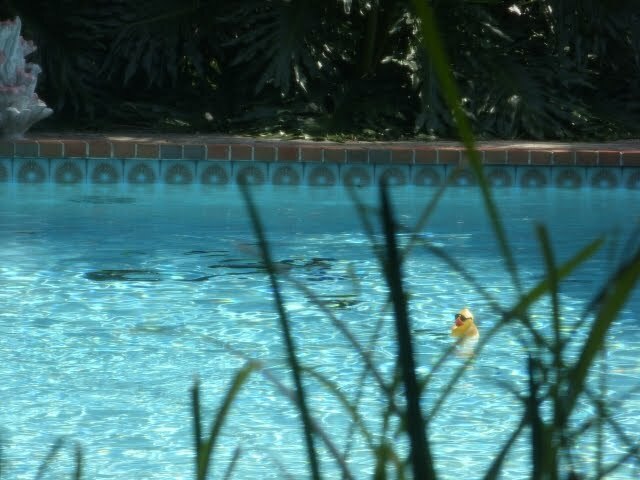 There are opossums and raccoons that seem to think that the little yellow duck is food and it ends up on the pool deck at least twice a month. Good riddance, it wasn't accurate anyway. As someone who has more than 20 years in Software Quality Assurance and Software Development, this sort of nonsense irks me to no end. I don't like going to Publix and discovering that I have pink legs that represent a mild first degree burn because someone has decided he needs to earn an extra 100K a year for some shadowy shareholders by firing their US workforce and shipping the jobs over to China. I never was completely comfortable with shoddy workmanship in something that I purchase, and for years I flat out would not buy Chinese merchandise. Good luck going China Free anymore, after all, they aren't free yet either and it is still the country of Tienanmen and the massacre therein. I think I shall be looking a bit closer next time I need a duck.